Both pictures taken on 4 April 2009 in Henderson Canyon. See Wayne Armstrong's pictures from Butler Canyon on 11 April 2009 from the most recent trip. See The Borrego Desert for links to more recent bloom pages. The Borrego Desert is the northern part of Anza-Borrego Desert State Park below an elevation of 3000 feet, named for the Borrego Valley and the town of Borrego Springs (map and expanded definition). This page gives information about the 2008-2009 bloom for all species in this area, with emphasis on the annuals that are responsible for the widespread showy blooms that appear in some years on the desert floor. The date of the last update to this page is given at the bottom of this page. The information here is by no means a definitive list to what is blooming in the Borrego Desert; it only records the species I've seen in bloom on my hikes that occur roughly every fourth day. Because the locations change, the numbers of species in bloom, and the number of plants in bloom, cannot usually be directly compared from trip to trip. However, the information here will give the reader an idea of what the bloom is doing in the Borrego Desert. The following table gives the storm totals, in inches, as of the last day of each storm. The storm totals were taken from the Weather Service Rainfall Storm Summary, except for Fallbrook and the Borrego Badlands. Occasionally other stations are missing in that report; if so, totals are taken from the Rainfall Summary Map. There is no weather station in the Borrego Badlands; the rainfall estimates are just guesses made from how wet the area appears on trips there. If a station didn't appear in the summary, I assumed the rainfall total was zero. Although this assumption is probably usually correct, it is not necessarily always valid since missing data plague all rain reports. Note that the total rainfall at the bottom of the table is since 1 October, since rain that falls earlier doesn't germinate the desert annuals (see below); this is different from the rainfall reported by the Anza-Borrego Desert State Park Visitor Center using the normal California rainfall year that begins on 1 July. 8 August 2008 0.00 ? ? ? ? ? 15 December 2008 2.40 0.98 0.15 0.75 0.47 ~0.4? 17 December 2008 1.61 0.87 2.13 1.14 1.54 ~1.5? 22 December 2008 0.51 0.04 0.00 0.00 0.00 ? 25 December 2008 0.51 0.08 0.00 0.00 0.02 ? 7 February 2009 1.65 0.91 0.08 0.24 0.31 0.31? 9 February 2009 0.63 0.90 ? 0.37 0.72 ? 16 February 2009 0.55 ? ? 0.24 0.58 ? See Predicting Desert Wildflower Blooms - The science behind the spectacle from the Arizona-Sonora Desert Museum for information relating to Arizona desert blooms. Every annual that is going to bloom this spring is in bloom or has finished flowering. 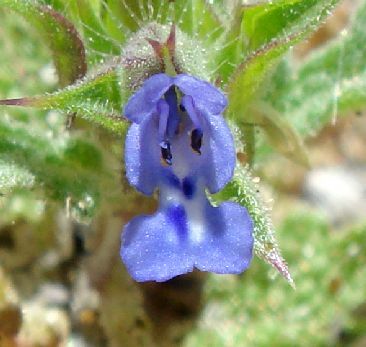 A number of annual species have finished flowering, including most of the species that produce carpets of flowers. We are still at the peak in the number of species in bloom, although we are past the peak in the total number of plants in bloom. 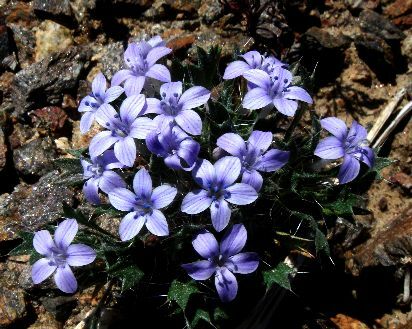 On 4/11/09 in Butler Canyon, I found over 2,300 plants in bloom from 93 different species, which is the largest number of species I've seen in bloom on a single day so far this year. See the plots below of the number of plants, and number of species, in bloom, versus time for this year. A total of 116 annual species have been observed in bloom as of 11 April 2009 (see detailed list); 207 total species have been observed in bloom so far this season. end of paved portion of Di Giorgio Road, Galleta Meadows (annuals): 10-26 February. Peak bloom defined mostly by the annuals is indicated by the word annuals or Geraea in parentheses above. The dates above were strongly influenced by the heat waves of 23 February to 3 March and 16-20 March, when high temperatures were mostly from 80 to 91°. The first heat wave ended the annual bloom in many places on the desert floor, but stimulated the hairy desert-sunflower, Geraea canescens, to burst into bloom, as well the perennials in the canyons on the westside. The second heat wave knocked out the Geraea bloom and much of the annual display in Glorietta Canyon. The duration of peak bloom given above range from 13 days to 42 days, with a median duration of 18 days, 2.5 weeks. This is a fairly typical interval for the peak bloom time for species on the coastal side of the mountains as well, such as at the Santa Rosa Plateau. Areas with a longer peak bloom duration are the westside canyons (Henderson, Rockhouse, S22 Montezuma Grade) which have a large range in elevation. Many annuals were smaller than normal due to no rainfall for 52 days after they germinated on 15-17 December 2008. Fortunately, the inch of rain on 7-9 February 2009, and the half inch of rain on 16 February 2009, helped many plants produce more blooms, and it has turned out to be a decent bloom season after all. In fact, the small size of most of the non-native Asian mustard, Brassica tournefortii, plants allowed the smaller native plants to produce a better show! Detailed reports since 1 February are given here; for earlier reports, see Reports from 28 November 2008 to 28 January 2009. These reports are just summaries of these conditions from each hike. Many of these hikes have much more complete botanical reports online with additional information; see Plant Trail Reports, San Diego County, 2009. 2/1/09: Rockhouse Canyon. The bloom is similar to that on 1/28/09, with the following three additional annuals now in bloom. There is only a single very small plant of everlasting nest-straw, Stylocline gnaphaloides, that germinated here this year, and it is now in bloom. The first plants of many of the following two non-native annuals, Mediterranean schismus, Schismus barbatus; and Asian mustard, Brassica tournefortii, have begun to bloom here. One plant of Parish's viguiera, Viguiera parishii, is beginning its bloom. Buds of cheesebush, Hymenoclea salsola, are growing larger and may begin blooming in the next week or two. Small buds have appeared on one plant of beavertail cactus, Opuntia basilaris, and on one plant of brittlebush, Encelia farinosa. 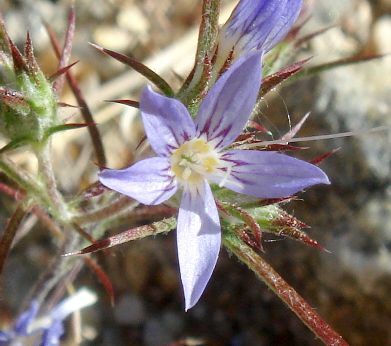 Chuparosa, Justicia californica, is in full bloom in Clark Valley along the Rockhouse Canyon Road. One plant of brittlebush, Encelia farinosa, is in full bloom along S22 near the bottom of the Montezuma grade, but most plants there are not yet showing buds. 2/5/09: Rockhouse Canyon. The annuals have popped into full bloom at several locations along Rockhouse Canyon Road west of Clark Lake! We spent about an hour photographing about ten annual species that had popped into bloom in the last four days. All the usual suspects were there, including spectacle-pod, Dithyrea californica (one even had its first fruit! ); narrow-leaved cryptantha, Cryptantha angustifolia; brown-eyed primrose, Camissonia claviformis ssp. peirsonii; Spanish needle, Palafoxia arida; desert dandelion, Malacothrix glabrata, and hairy sand verbena, Abronia villosa. We found some perennial / subshrub plants of California fagonia, Fagonia laevis, in full bloom there as well. Chuparosa, Justicia californica, continues in full bloom along the Road. On our car stops along Rockhouse Canyon Road, and hike up Rockhouse Canyon to upper Rockhouse Canyon, we saw over 500 individual specimens of 42 species in bloom. In Rockhouse Canyon, Bladderpod, Isomeris arborea; and desert-lavender, Hyptis emoryi; continue to be in full bloom. In the upper canyon, desert apricot, Prunus fremontii, is still in full bloom, but is near its end. However, the annuals have not yet begun blooming in most locations here. 2/11/09: Coyote Canyon Road, Box Canyon. There are carpets of flowers now along Coyote Canyon Road, most of them from spectacle-pod, Dithyrea californica, which is in full bloom seemingly everywhere along the Road. Some plants have their first beautiful fruit that looks like spectacles. Dune primrose, Oenothera deltoides; hairy sand-verbena, Abronia villosa var. villosa; and brown-eyed primrose, Camissonia claviformis ssp. peirsonii; have all begun blooming in the area at the end of Di Giorgio Road. Driving along Coyote Canyon Road reveals new species in bloom regularly, including the first blooms of desert dandelion, Malacothrix glabrata, in a number of places. There is no water at First Crossing, so many passenger cars, driven carefully, can make it to Second Crossing. We were pleased to find a nice patch of longbeak streptanthella, Streptanthella longirostris, between First and Second Crossing. 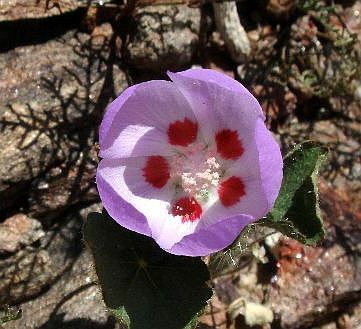 Most annuals in Box Canyon have not yet begun blooming. On our car stops along Coyote Canyon Road, and hike up Box Canyon, we saw over 1100 individual specimens of 53 species in bloom. 2/17/09: Rockhouse Canyon Road, Henderson Canyon Road, Coyote Canyon Road, Box Canyon. The carpets of flowers along Coyote Canyon Road are even better, with desert dandelion, Malacothrix glabrata; Fremont pincushion, Chaenactis fremontii; and desert chicory, Rafinesquia neomexicana, beginning to join the show. Hairy sand-verbena, Abronia villosa var. villosa, is now producing its usual carpets of flowers along S22. The first hairy desert-sunflower, Geraea canescens, blooms have appeared along Henderson Canyon Road. Buds of desert lily, Hesperocallis undulata, will pop in about a week at S22 and Rockhouse Canyon Road. On our car stops along Henderson Canyon and Coyote Canyon Roads, and hike up Box Canyon, we saw over 1600 individual specimens of 61 species in bloom! Most annuals in Box Canyon are still the same, and have not yet begun blooming. 2/20/09: S22, Borrego Dunes Area of Borrego Badlands. This area of the Borrego Badlands probably has the most total blooms of anyplace, but unfortunately 99.9% of the blooms are from the non-native Asian mustard, Brassica tournefortii. However, there are 33 native species in bloom here, including the first blooms of the desert lily, Hesperocallis undulata. There are hundreds of plants here total, and we observed about 50 of them showing off their first blooms. 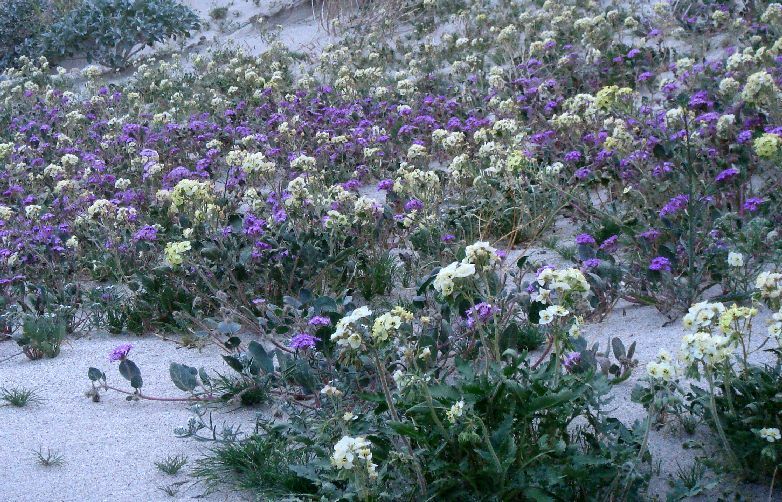 There are large numbers of hairy sand-verbena, Abronia villosa var. villosa; and dune primrose, Oenothera deltoides, in bloom in a number of locations. We found the first blooms of about 20 plants of hairy desert-sunflower, Geraea canescens, ten stunning plants of Borrego milk-vetch, Astragalus lentiginosus var. borreganus; and five plants of gray desert sunflower, Helianthus niveus ssp. canescens. 2/24/09: Coachwhip Canyon. Peak bloom has begun! We found one lovely field of flowers that can't have any more flowers blooming in the future than are blooming right now. The roadside of S22 is covered with annuals in flower; we found 31 species in bloom within a 100 foot stretch along the road, and another 16 species in bloom along our hike in Coachwhip Canyon, for a total of 47 species in bloom here. We estimated we saw 1786 individual plants in bloom. Since we capped the count for each species at 99 plants, we easily saw over 2000 individual plants in bloom. 3/2/09: Little Surprise Canyon, Galleta Meadows, Di Giorgio Road, Henderson Canyon Road, Fonts Point Wash, Coachwhip Canyon entrance. This was primarily a car trip to sample the major bloom areas for a group of botanists from the Pasadena area, with the only hiking excursion being in Little Surprise Canyon. Little Surprise Canyon had about 40 species in bloom, with more yet to come, and was a delight, even in 85° heat in the morning. There were literally thousands of plants in bloom just in this small canyon, many producing good displays already. After Little Surprise Canyon, we stopped at Galleta Meadows at the corner of Borrego Springs and Henderson Canyon Road. It was interesting that this area was past peak bloom, even though Little Surprise Canyon, just a few miles away, was not yet at peak bloom. Next stop was the end of the pavement of Di Giorgio Road. Michael Charters and I were shocked to see how the bloom had faded there. On 2/11/09, this area looked glorious, with vast fields of blooms from spectacle-pod, Dithyrea californica, and the first flowers of a number of other species. Today, the spectacle-pod was all in fruit, and many of the other species were either in fruit or on their last flowers. The east end of Henderson Canyon Road had a good display of hairy desert-sunflower, Geraea canescens, although it is patchy and struggling to overcome the invasive non-native Asian mustard, Brassica tournefortii. The S22 roadside near Coachwhip Canyon still had many blooms. The area of the mudhills on the east side of Coachwhip Canyon showed the strong influence of species and habitat. The plants on the mudhills are just starting their bloom, and are a week or two away from being in full bloom. Yet right at the base of the mudhills, in the sand, the desert lily, Hesperocallis undulata, plants had finished their bloom and were in fruit! During this day, we saw over 2400 individual plants in bloom of 74 species. 3/7/09: Clark Valley, Henderson Canyon Road. The desert floor is still at peak bloom, and flowers are beginning at 3000 feet elevation in Culp Valley. On my drive in, Culp Valley was lit up with the pinkish-purple blooms of the non-native redstem filaree, Erodium cicutarium, which unfortunately has taken over most of the open spaces between the shrubs, along with the non-native red brome, Bromus madritensis. The bottom of the Montezuma Grade on S22 was lit up by native species, with hundreds of plants in bloom of brittlebush, Encelia farinosa; creosote, Larrea tridentata; and Parish's poppy, Eschscholzia parishii. The hairy desert-sunflower, Geraea canescens, display on east Henderson Canyon Road was still going strong. The base of Coyote Mountain just a bit west of the PegLeg Monument had a good display of belly flowers, including desert 5 spot, Eremalche rotundifolia, bristly langloisia, Langloisia setosissima; yellow-head, Trichoptilium incisum; and desert star, Monoptilon bellioides. The parking spot for this area is marked with a beautiful display of Arizona lupine, Lupinus arizonicus, on the south side of S22. We spotted the first cholla bloom of the season, on silver / golden cholla, Opuntia echinocarpa, at S22 and Rockhouse Canyon Road. In Clark Valley northeast of Clark Lake, we found about 40 plants in bloom of desert lily, Hesperocallis undulata, including one flower stem 30 inches tall! Some of the plants were finished blooming, or on their last flowers, but some had a number of flowers yet to come. Borrego milk-vetch, Astragalus lentiginosus var. borreganus; and Salton milk-vetch, Astragalus crotalariae, are beginning bloom in Clark Valley. We saw over 2200 plants in bloom of 60 species during this entire day. 3/11/09: Henderson Canyon Road, Ella Wash to Vista del Malpais. The hairy desert-sunflower, Geraea canescens, display on east Henderson Canyon Road was still going strong. The base of Coyote Mountain just a bit west of the PegLeg Monument has an even better show of belly flowers than four days ago, and pebble pincushion, Chaenactis carphoclinia, is now in full bloom there. Surprisingly, our hike along Ella Wash was like a trip back a few weeks in time. Several species were still blooming there that were essentially finished blooming along S22 here, including hairy sand verbena, Abronia villosa; desert lily, Hesperocallis undulata; and brown-eyed primrose, Camissonia claviformis ssp. peirsonii. Desert pincushion, Chaenactis stevioides, is now in full bloom here, and many areas of the Badlands are covered with Arizona lupine, Lupinus arizonicus in full bloom. The first blooms of little desert trumpet, Eriogonum trichopes, were seen. We saw over 3000 plants in bloom of 67 species during this entire day. Reports after 3/11/09 not yet online. Most of my pictures were taken for scientific purposes, and not specifically to show anything about the bloom. However, they may be of interest to people showing some aspects of what the bloom was like on a given date. My pictures are not even on standard webpages; I link to a directory and you have to click on the link for each picture to see it. Scientific names are used almost exclusively for the picture names. The context for most of these pictures is given in the botanical reports from each hike. In contrast, on the hikes of Michael Charters here, he documented many of the plants in bloom, and placed them on standard webpages with common and scientific names. I recommend you click on his pages first. Wayne Armstrong also photographed some of the flowers on one walk. The annual bloom this year is past its peak in the lower desert. The first two plots show what was observed on each trip, the total number of species in bloom and the total number of plants in bloom. The total number of plants in bloom for each individual species is capped at a maximum of 99 plants. The next two plots give the cumulative total numbers from all trips so far this season, of all species seen in bloom and of all annual species that germinated this year and have begun blooming. Thus this does not count any annual species that survived from last year and is now blooming. These cumulative total numbers include the number of species on a given trip as well as those from all trips previous to that trip. First, long hikes will find more plants in bloom than short hikes. For example, the hikes of 12/29, 1/2 and 1/9 were all in Henderson Canyon, but were 4, 7 and 8 miles long, respectively. The increase in the number of plants was due almost entirely to the length covered. Second, some areas have a higher species diversity than others, and so will have more species blooming at a given time. For example, on 2/20/09, I botanized the Borrego Badlands, which has significantly fewer species than the Coyote Creek area I had botanized for the previous two trips. As a result, the total number of species observed in bloom skidded from 61 to 35, even though the bloom overall in the Borrego Desert is still getting better. Note that the cumulative number of species, and annuals, seen to be in bloom from all trips this year continued to increase, since the Badlands have some species not found elsewhere. I've added yellow diamonds to some points in the plots to show when I've switched areas, which follow the color-coding in the table headers below. Hikes in the same general area on successive trips are color-coded in the table headers below. If the color changes between columns, it is a tip-off that different environments, and hence plant species, might have been sampled. There is no significance to the color used; only the change in color is significant. When a color change occurs, there is no implication that it was back to the environment sampled when that color occurred previously. I've added two bars in each plot, that represent the time of peak bloom estimated by Park Rangers. Two bars were needed since I wasn't sure of the meaning of the word between in the Park Rangers statement that they anticipate the peak blooming season to hit between the 3rd week of February and the 2nd week of March, depending on the weather. The lower pink bar extends from the beginning of the third week of February (2/15) and the end of the second week of March (3/14). The upper green bar extends from the end of the third week of February (2/22) to the beginning of the second week of March (3/7). The number of species in bloom began its peak at ~1 March, and possibly will end its peak at ~15 April, a period of six weeks. This is almost the same duration as the peak bloom at the Santa Rosa Plateau for 2001-2005, where the number of species in bloom typically peaks from ~1 April to ~10 May, a time lag of about four weeks. The following tables not yet updated with numbers from trips after 3/11/09. The following table gives the numbers used for the above plots, for the last two months. For earlier numbers, see Numbers from 28 November 2008 to 28 January 2009. The individual observations used to obtain these numbers are in the List of Species in Bloom On Each Trip. The list is not yet updated with numbers from trips after 3/11/09. The table gives the number of plants observed to be in bloom for each species on each hike, with a maximum value of 99 plants for each species. This maximum value prevents one species from dominating the total plants in bloom, and makes it much easier on me to keep track of the bloom. This table gives the number of plants in bloom only since 1 February 2009. Some species thus have no number of plants in bloom listed in this table since they were observed in bloom only on trips prior to that date. For those earlier trips, see list of species seen in bloom from 28 November 2008 through 28 January 2009. Of course, species that bloom later in the year are not present in this list, so it is not the equivalent of a plant checklist for the Borrego Desert. 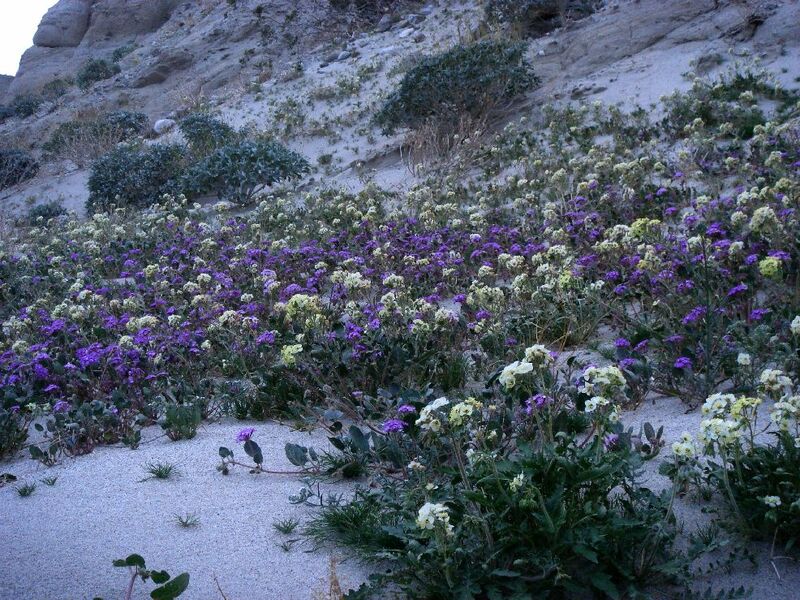 Anza-Borrego Desert State Park Wildflower Hotline: (760)767-4684. "Information on this recording is updated regularly." Copyright © 2008-2009 by Tom Chester.